Stretched and framed. Wood frame with gold streaks showing through. 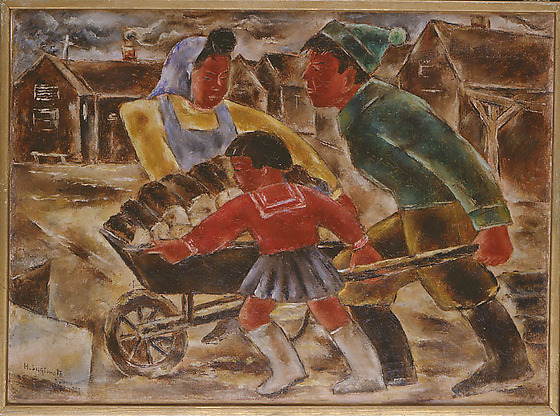 Family of three pushes a wheelbarrow full of wood to be used to warm their barracks. In the foreground, a girl in red sailor top, short black pleated skirt and white boots walks along leftside of wheelbarrow with her back to the viewer, holding the left handle in her right hand and pointing in front of it at an obstruction with the other. At right, man in green cap and jacket with brown pants and boots grips handles and pushes wheelbarrow stacked with logs forward toward the left. On the opposite side of the wheelbarrow from the girl, a woman in blue and yellow wearing a kerchief over her hair pulls the wheelbarrow along. In the background barracks with smoke from chimneys are visible. Sky is dark. While most of the other camps relied on coal for heat, Jerome inmates chopped and gathered wood from the surrounding area to help warm their barracks.